Truckee’s Monique Fellows races to a first place in giant slalom at Alpine Meadows on Tuesday, Dec. 12. 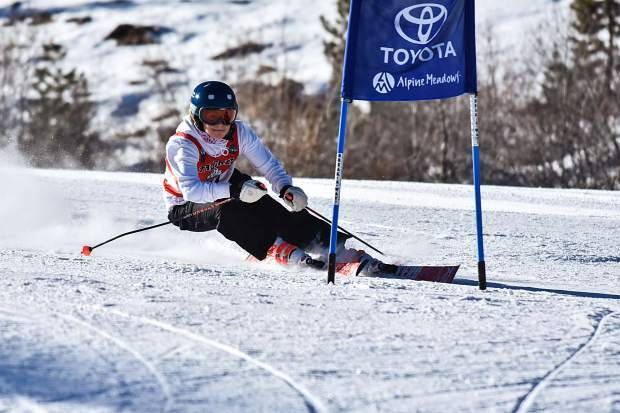 Local high school teams hit the slopes at Alpine Meadows Ski Resort on Tuesday, Dec. 12, for the year’s first competition with seven squads competing in giant slalom. 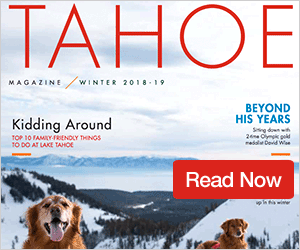 The Truckee girls, nicknamed the Red Train, opened the 2017-18 with a bang, placing six athletes in the top 10 in giant slalom to take a 215-201 win over second place, North Tahoe. Truckee junior Monique Fellows posted the third fastest time during the first set of runs at 31.08 seconds, but blistered the course in her second run with a time of 30.96 second to edge North Tahoe senior Anna Yamauchi by 0.3 seconds with a total time of 1:02.00. Yamauchi posted the fastest time of the day, finishing her first run with a time of 30.92. From there it would be all Truckee, with Susan Greeno finishing in third with a total time of 1:03.00, followed by junior Danielle Dolan in fourth with a total time of 1:03.10. Freshman Annsley Akers made it four Wolverines in the top five with a total time of 1:05.30. 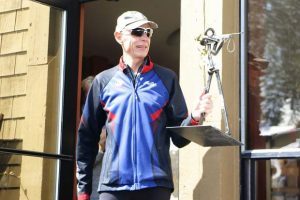 Truckee Head Coach Patrick Mooney highlighted the leadership of Staudenmeyer, a team captain, who stayed at the starting line in support of her teammates until the racing had concluded. In junior varsity racing, Sarah Shaffer and Ani Walterscheid captured second and third, respectively, for Truckee. Last year’s state runners-up, North Tahoe, got off to a terrific start to the season with four athletes placing in the top five to take a 214-204 victory over second place, Douglas. Douglas’ Sean Dunkelman took the individual title with a total time of 1:00.70. From there, sophomore Guthrie Goss started North Tahoe off with a total time of 1:00.80 for second place, followed by freshman Oliver Fralick in third with a total time of 1:01.80, junior Thomas Mercogliano in fourth with a total time of 1:02.30, and Quinn Early with a total time of 1:03.10 for fifth place. Kevin Tidd finished with a time of 1:05.20 to give the Lakers five skiers in the top eight. 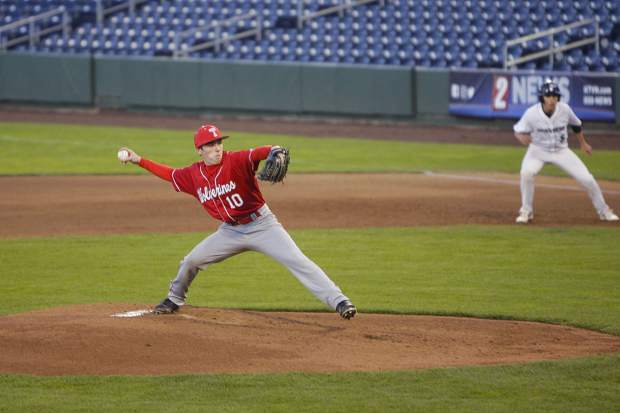 The Wolverines came into the season opener shorthanded with only five racers. The boys would pick up 119 points on the day to claim fifth as a team. “Although some of the boys had difficulties with the course, they all showed a great deal of determination and courage to complete the course, try their absolute best, and make a strong showing in spite of the obstacles they faced,” said Mooney in an email to the Sierra Sun. The Wolverines and Lakers will next head to Mammoth Mountain Ski Area on Dec. 20 for more giant slalom racing.